Present days, water emergency in India has been come to caution extents and its wastage amid transmission is distinguished as the significant cause in charge of the issue. So as to determine the issue to some degree we have thought of Automatic Turn ON and OFF of Induction Motor in houses, this venture which is a basic model used to save water and additionally power, and can be actualized in the constant work. 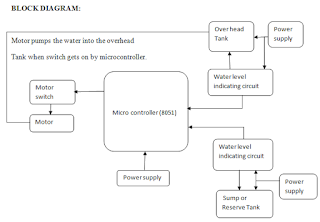 The above existed idea of water level indicator circuit is used twice to indicate the levels in the sump as well as the overhead tank and the output of the two water level indicators are given as the input signals to microcontroller. 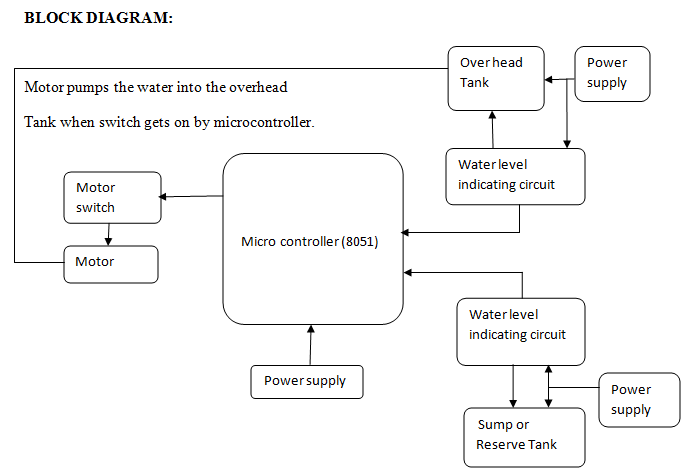 The Microcontroller is programmed in such a way that if water level is above the minimum water level in lower tank, water gets pumped to upper tank and as soon as the upper tank gets filled, motor switches off automatically. An overhead and underground tank Keil C Software. Constant and reliable water supply. Functions with minimal or no human interface. 3. Easy maintenance; install and forget for years. Low cost and it is absolutely affordable by all. Prevents dry running of motor and so water, energy, power not get wasted. Monitoring and controlling of water level in reservoirs, dams are important in applications related to agriculture, flood prevention etc. Domestic, industrial, medical fields etc. 0 Response to "Automatic ON and OFF of Induction Motor Mini Project"